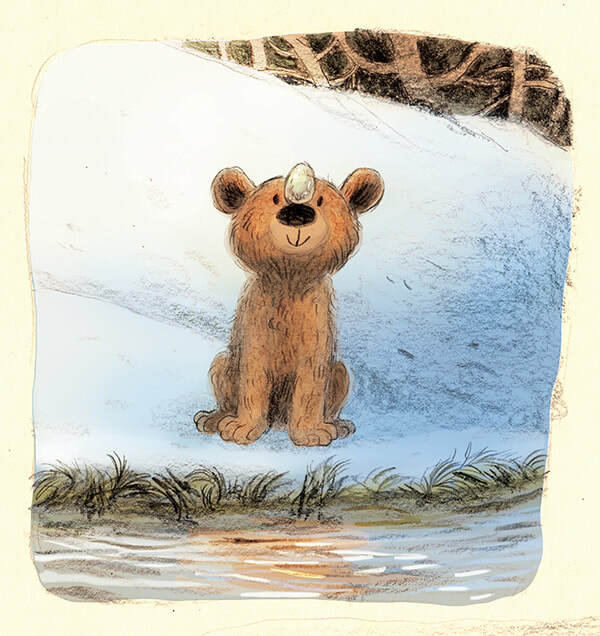 Celebrate Spring with Little Bear! 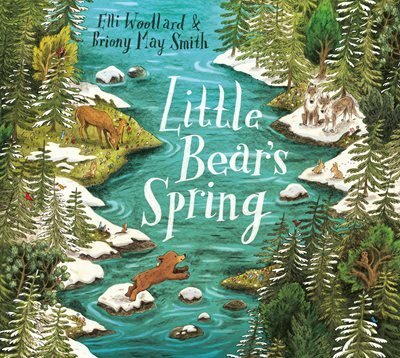 Congratulations to Elli Woollard & illustrator Briony May Smith for their stunning new book Little Bear's Spring which hit the shelves last week. It has also been selected as Indie Book of the Month for March by the Booksellers Association, which is a fantastic nod to their first collaboration! 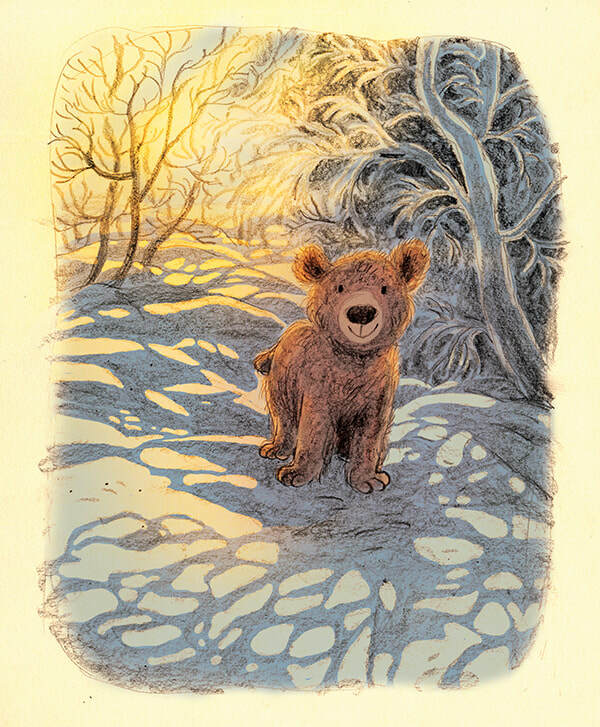 Little Bear's Spring is a lyrical tale of friendship and a celebration of nature and its changing seasons. 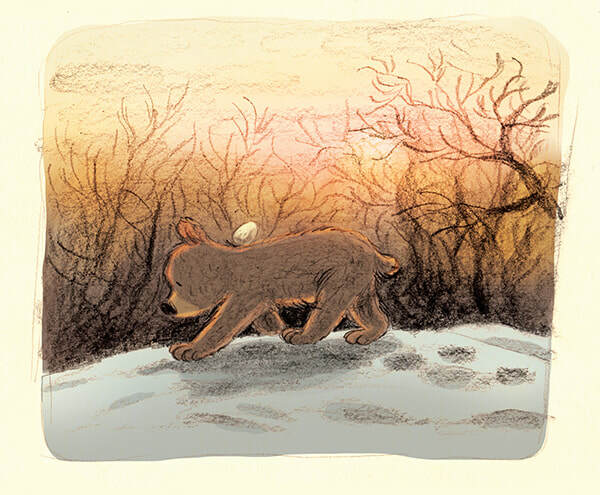 The story follows a young bear as he wakes from his long winter sleep and, finding himself alone, he goes off in search of someone to play with. Briony's artwork brings a sun-dappled springtime landscape to life with breathtaking beauty! 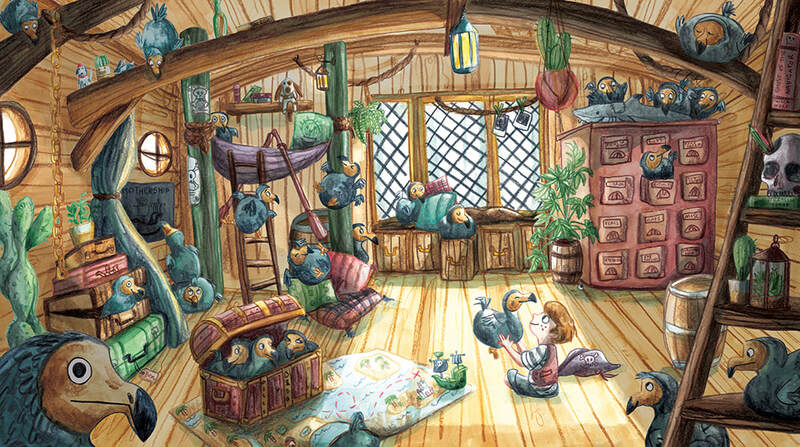 She has kindly given us a peek into her artwork process in this Q&A below. What initially drew you to this project, Briony? I’m been a big fan of Elli Woollard’s writing and so when the text was first shown to me and I found out it was her story, I knew it would be amazing. Reading the first few lines I was hooked! There are so many stunning verses - ‘But when the bear picked up the stone from the slope, it felt warm, like a promise, and smooth, like new hope' and it’s so enjoyable to read out loud. 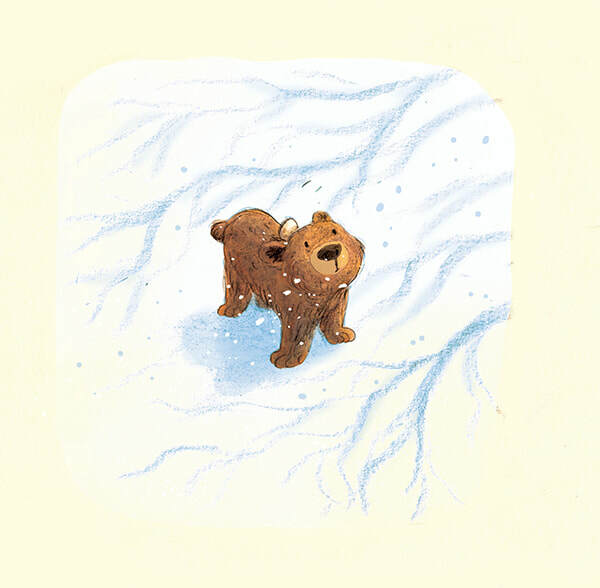 I could also picture Little Bear straight away, as he went ‘lippetty-loppetty’ off on his journey. The setting meant I could have lots of fun experimenting with the snow, and play with the sunlight on the wintery landscape, contrasting with the fresh greens of spring at the end. And all the team at Macmillan are absolutely amazing and made the project so wonderful to work on! 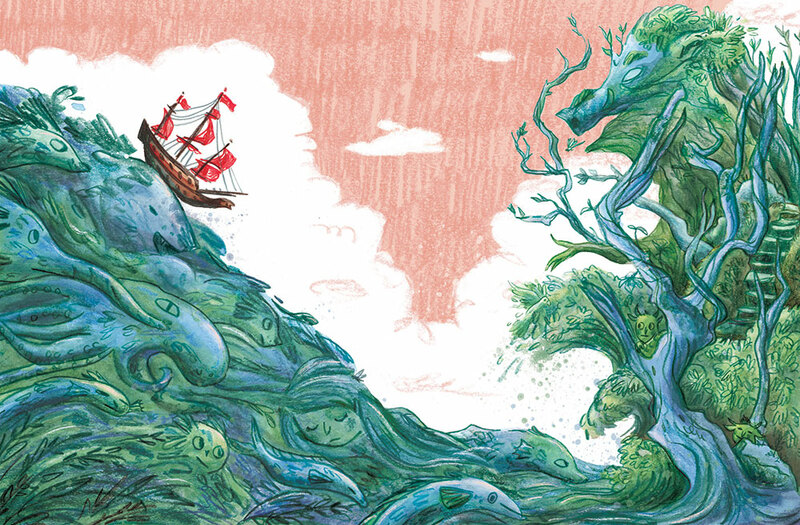 ​Can you talk us through your process for creating the illustrations for the book? 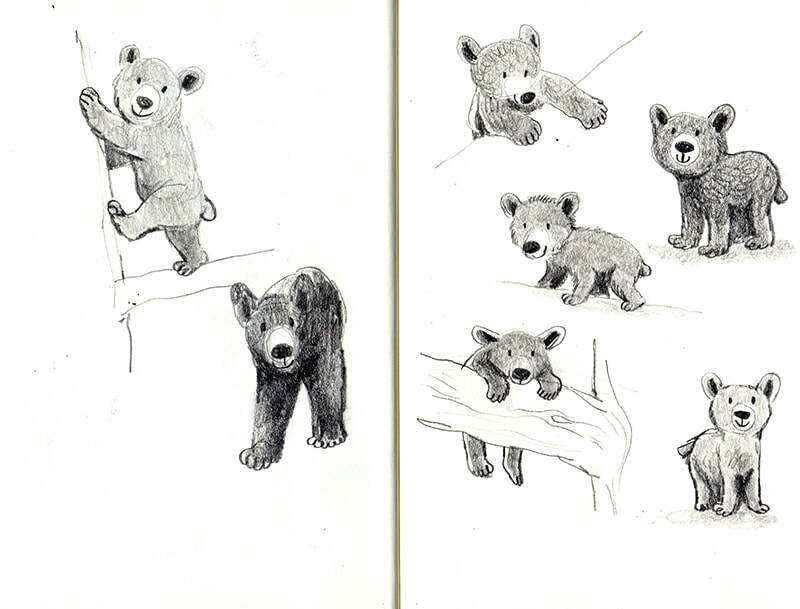 First I started creating the Little Bear character. 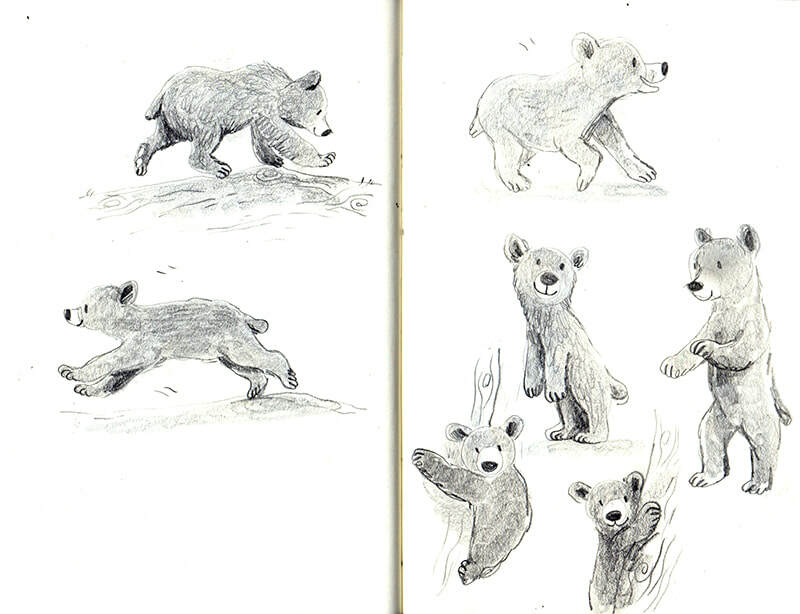 What could be more fun than googling baby bear photos and videos! I also had a little play with some concept artworks, to practise the lighting on the snow. Then I got stuck into roughing out the pages, introducing the other animals and researching the flora and fauna of the rockies, where it is loosely set. I like to make sure the flowers and animals are as accurate to the landscape as I can make them. Once the roughs were approved I started to work on the final artwork. I had so many photos archived of Canadian wild flowers and red cardinal birds. I also had some fun elongating the story with the endpapers, which show the vast difference between winter and spring at the beginning and end of the story. Did many of the spreads change significantly throughout the process and are there any you wish had made the cut but didn't? There aren’t any that didn’t make the cut that I wish had, but the challenge was balancing the horizon line of the mountains and allowing room for the text to sit. Luckily, the snowy landscape created it’s own space for the text in the ground in many spreads! Do you have a favourite spread or piece of artwork? ​Much of the story takes place in snow, were there challenges to illustrating predominantly white scenes and if so, how did you overcome them? I found the challenge of creating snowy landscapes really enjoyable. Snow can absorb the colours of sunrise and sunset, and sunny shadows, in lots of really interesting ways. We had a lot of snow as I was starting work on the book, which was the perfect opportunity to take reference photos. Low sun and long shadows, snow drifts, flowers poking though the snow, so I had lots to draw on. I think the transitional spreads were the most challenging - you can’t champion one season over the other just yet, you have to show a bit of both. 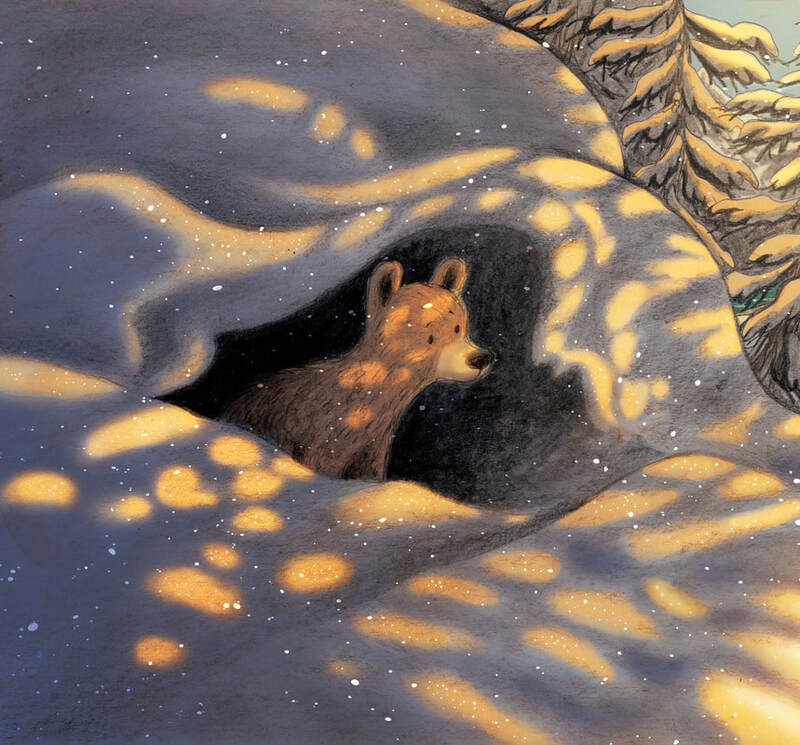 Some of my favourite spreads to work on are the snowiest, where I was able to play with the sunlight and shadows affecting it’s colours. 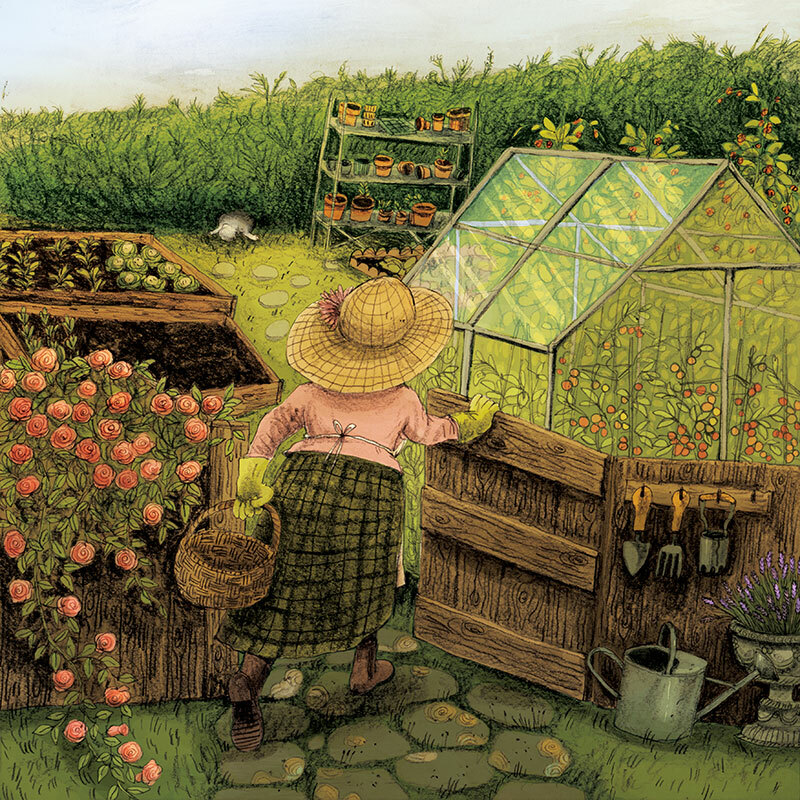 You’re so good at adding sub-plots and incidental characters in your illustrations, is there anyone in particular that children can enjoy look out for? There is a chipmunk who looks directly at the reader here and there, often reflecting the Little Bear’s mood or safety. The red cardinal bird steals a twig from Little Bear for his own nest in one spread. I really enjoyed hiding the smaller critters in the artwork on the sidelines, especially because there are so many animals to choose from in that landscape. Little Bear’s Spring has been selected as INDIE picture book of the month by the Bookseller's Association - congratulations! Can you give us a heads-up of any events surrounding the book’s launch that you will be involved in? Little Bear's Spring, written by Elli Woollard and illustrated by Briony May Smith, designed by Lorna Scobie, is published by Macmillan Children's Books, £11.99 (HB) / £6.99 (PB). 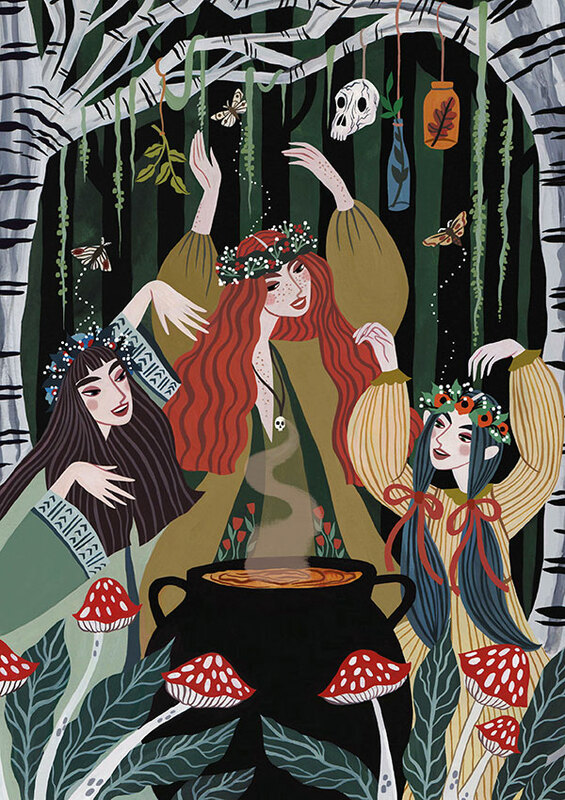 ​​We're delighted to be representing Rachael Dean at Pickled ink. Her portfolio is characterised by bold and captivating images that reflect her passion for travel and the great outdoors. 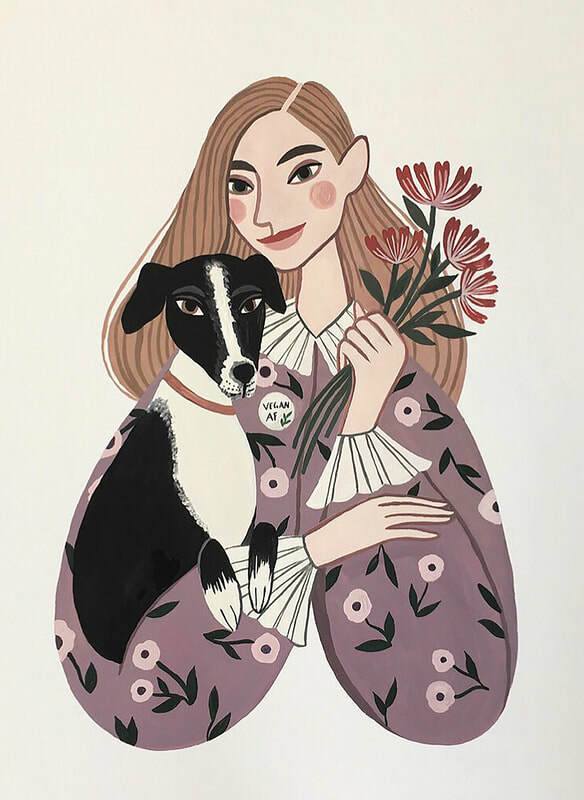 We caught up with Rachael to find out about her illustrating process, who inspires her, and how she manages to juggle deadlines whilst keeping her 30,000 followers on social media entertained. Welcome to Pickled ink, Rachael, it’s a pleasure to be representing you. You graduated in 2017 with a first class illustration degree from Liverpool’s John Moore University, and have a spectacular portfolio. Can you tell us about your process, from initial inspiration to creating the finished artwork? ​Do you have a favourite part of the process, or an area that you find the most challenging? I think the painting process is probably my favourite stage, because although I always have an idea in mind about how the piece will look, I usually end up pleasantly surprising myself with a slightly different outcome. The area I find most challenging can be the process of inventing original ideas at the beginning of the project, because it isn’t always easy to think up new concepts! ​Can you describe a typical working day? Always coffee first! Then sometimes I’ll try and fit in a half hour run in the morning, or afternoon so I’m more focused throughout the day. I’ll usually check emails before working on anything practical, and then I’ll either focus on projects or web shop errands throughout the day with regular breaks. I always work into the evening, but I enjoy working long hours! ​Are there any illustrators that have particularly influenced you and your work? And equally any authors that you admire and would love to collaborate with? I find the work of Rebecca Green, Adelina Lirius, Júlia Sardà and Carson Ellis incredibly inspiring. Their characters are memorable and original, and I love their use of colour and imaginative concepts. In terms of authors, I admire Kyo Maclear, who wrote ‘The Liszts’, because I find her ideas really quirky and different. I’d also love to recreate illustrations for old stories, for example, Maurice Sendak’s ‘Where The Wild Things Are’. You have a large following on social media and regularly update your feeds, do you find it hard to juggle being active on social media with your commissions and deadlines? Do you have any tips for illustrators looking to engage more on social media? Yes, I have sometimes found it difficult when working on behind the scene projects and I am unable to post new work, because there can be a pressure to keep your feed constantly updated. However, I try to showcase old work in new ways whenever this is the case. I think it helps to put yourself into your page every so often too, so your followers can meet the creator behind the work. But overall, I think that consistency with marketing, style and content is key to engaging your audience. ​We’ve had a lot of interest in your work already, what would your dream commission be? There are so many projects I would love to work on! But I think to be able to eventually work on any book project that portrays a profound message or something a little ‘quirky’ and different would be fantastic (something memorable that stands out). 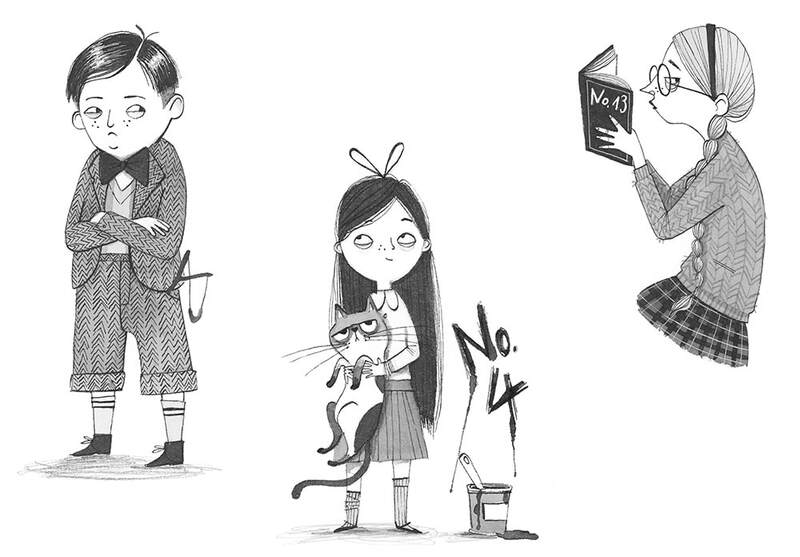 I would also love to work towards writing and illustrating my own book one day too! 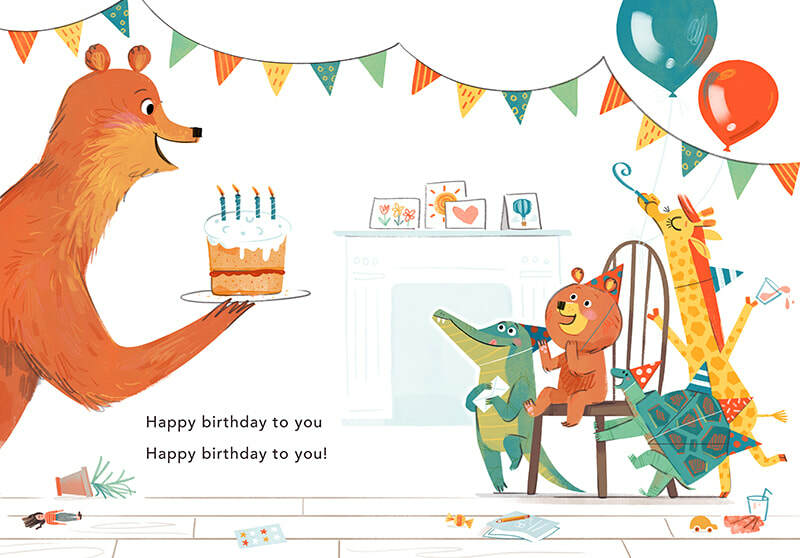 When Laurie Stansfield submitted her portfolio to Pickled ink, we were struck by her vibrant illustrations, which felt playful, fresh and confident - perfect for young readers. After meeting her soon after, we realised that not only would her illustrations be a huge asset to our portfolio, but that we’d get along very well too, so we’re incredibly excited to be representing Laurie at Pickled ink. 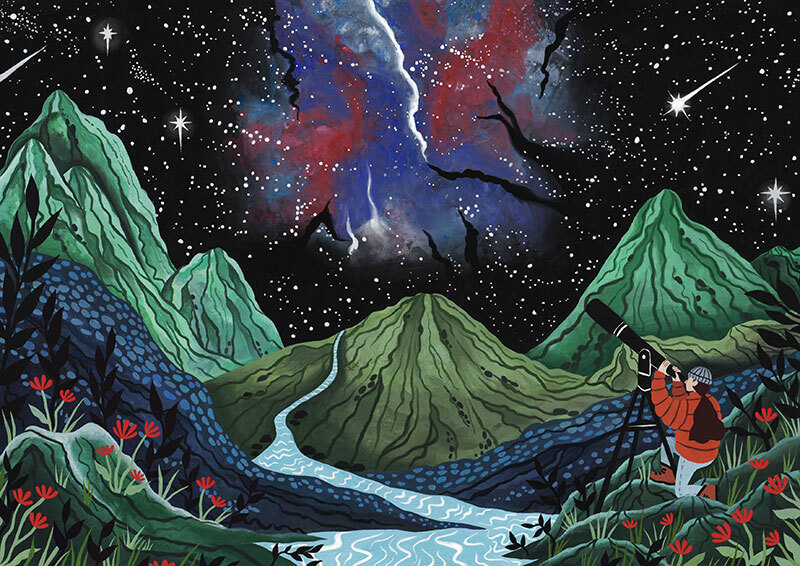 Laurie studied illustration at The University of the West of England, graduating in 2010. 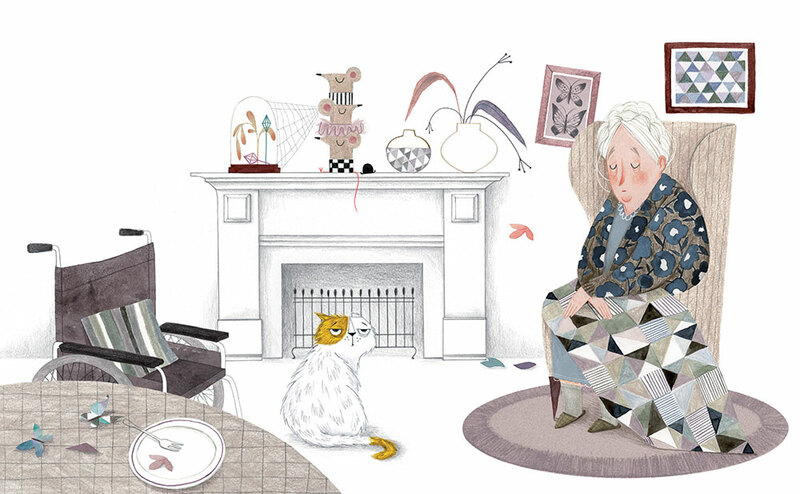 She was shortlisted for the Macmillan prize that same year and has been honing her illustrations for the children’s book market since. Sketching in pencil before creating her colour art entirely digitally, Laurie uses a loose line, and plenty of texture in an effort to recreate the traditional hand-made aesthetic which she admires so much in others. ​Her first book commission, POEMS OUT LOUD! will be publishing with Ladybird later this year, and with plenty of exciting projects in the pipeline we’ll be sure to have more announcements from her soon. New Artist - Alice McKinley! 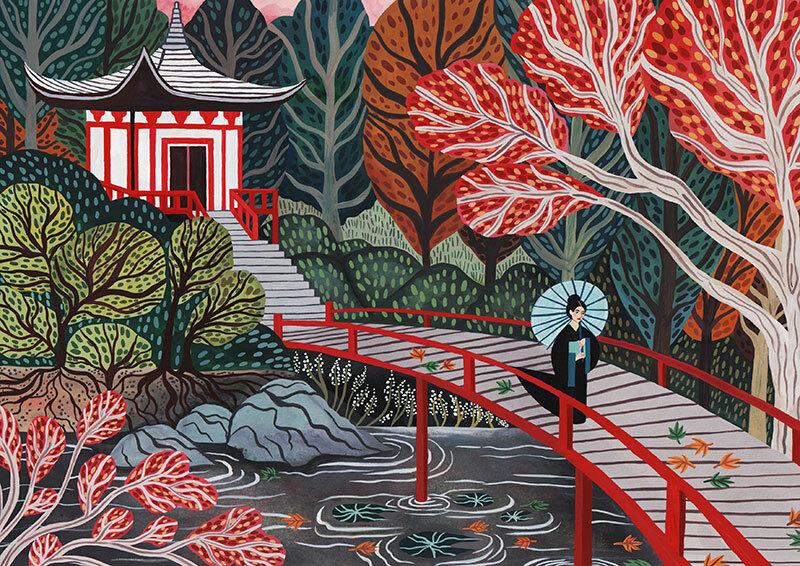 We're delighted to welcome Alice McKinley to the Pickled ink portfolio. Pickled ink came across Alice's work at her graduate show earlier this year and instantly fell in love with both her story book ideas and illustration work. Her characters are full of wonderful expression and movement. 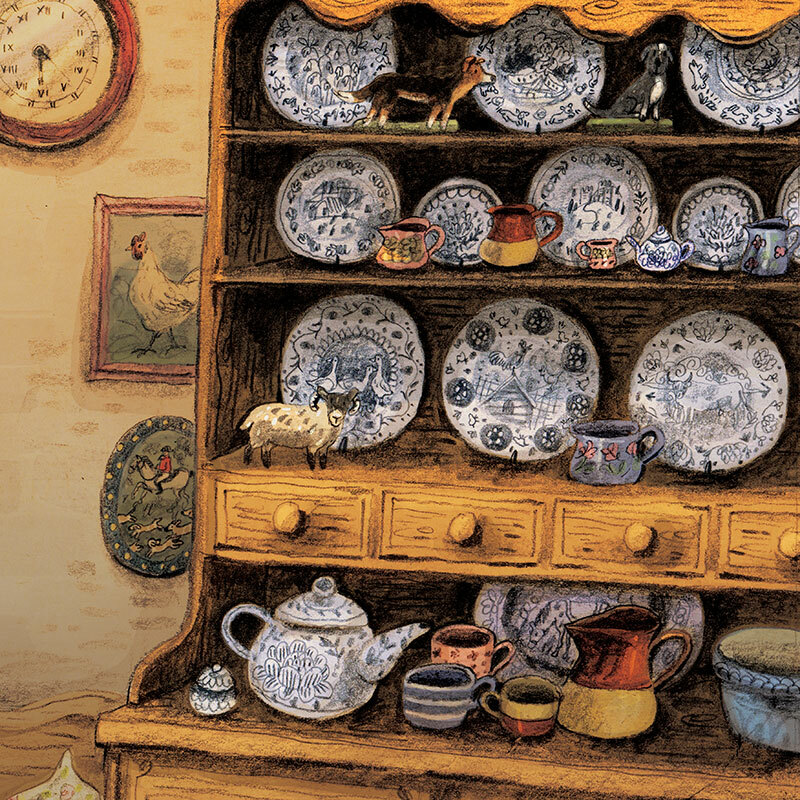 We weren't the only ones to think so and earlier this year we negotiated a 2-book deal for Alice's author-illustrated picture books (the first publishing in 2020), and she has been squirrelling away on this ever since. Details are still under wraps but when we are able to share them, we will do so here, so stay tuned! 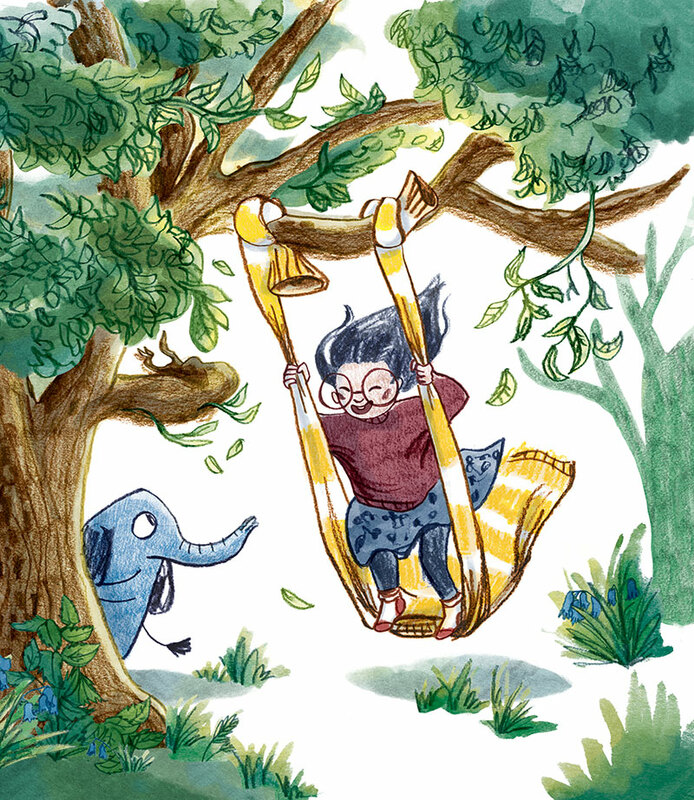 Alice has worked in publishing for the best part of 4 years, working with Andersen Press, Little Tiger Press and Nobrow. 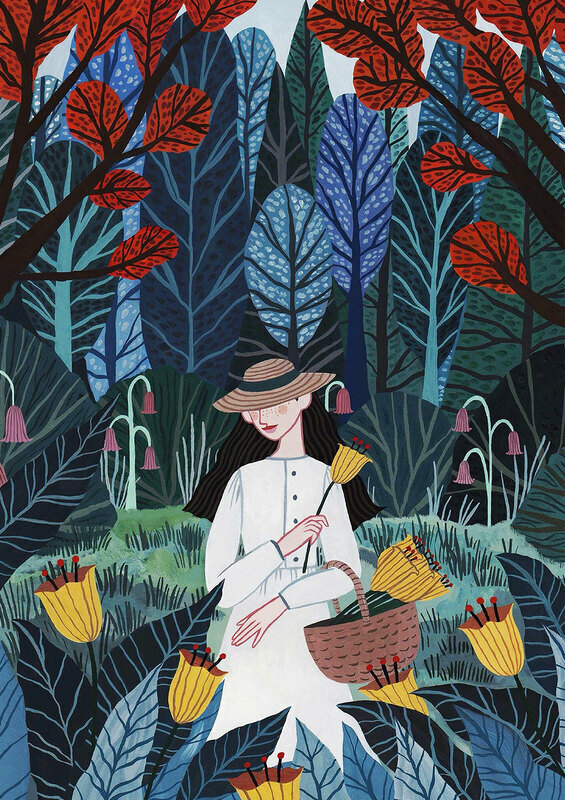 She decided to chase her dreams and become an author-illustrator and completed the Children’s Picturebook Illustration MA at the Cambridge School of Arts in 2018. Earlier this year Briony May Smith was asked to illustrate the Google banner celebrating the 100th birthday of Dame Cicely Mary Saunders, founder of the Hospice Movement. We caught up with Briony to find out a bit more about this exciting commission and how she approached it. 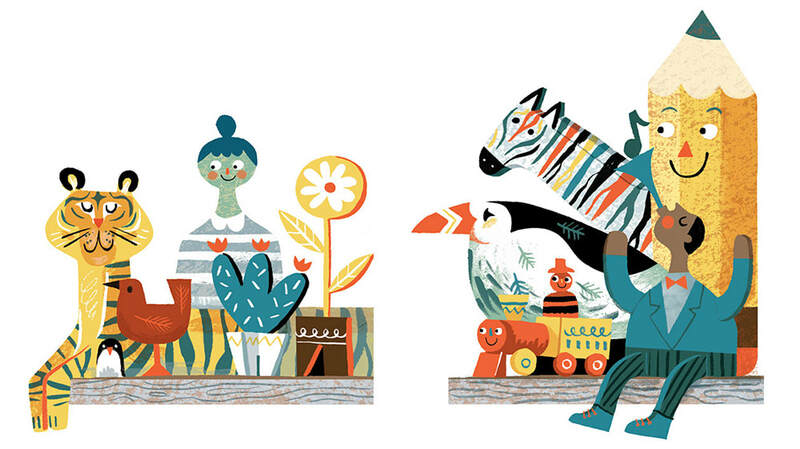 Illustrating a Google Doodle is quite a daunting task, we’d love to know how you approached the brief? I was given a bit of information about Cicely Mary Saunders, some recent examples of Google Doodles created to celebrate similarly brilliant women, and the dimensions for the artwork. After that it was a very open brief, which was very exciting to explore lots of ideas! Throughout the project the feedback and advice was fantastic and really helped the artwork’s direction. Because of the subject matter, the nature of the work Saunders dedicated her life to, I felt it was important to do as much research as possible. This led me to discover the wide variety of symbolism that could be incorporated into the brief, as well as the overall mantra that Saunders lived and worked by. Was there one strong vision from beginning to end, or did the roughs go through some revises? The first roughs were quite far removed from the final artwork. I was focusing heavily on symbolism, but I think it’s a subject that can’t so quickly be interpreted when it’s stripped back. Once I started thinking about it more literally, which was suggested by the amazing Google Doodle team, it was a stronger concept. You were asked to depict Dame Cicely Saunders, founder and pioneer of The Hospice Movement. Much of her time was spent working in hospitals. How did you paint a hopeful positive picture of her in a setting that people often think of negatively? I think having researched so much about Saunders' work meant that two quotes stuck out in my mind. Saunders said: ‘You matter because you are you, and you matter to the end of your life. We will do all we can not only to help you die peacefully, but also to live until you die.’ Which seems like such a hopeful, positive approach to a very sad time for many people. The idea of enjoying all the time you have left made me think of having surroundings that everyone would enjoy. Soft colours, quilted bed spreads, paintings on the walls, a happy outlook from a window, flowers, keepsakes from your own home -photos of loved ones. Another quote was from ‘All in the End is Harvest: An Anthology for Those Who Grieve,’ a book edited by Agnes Whitaker. Saunders is known for her praise of this book, and the poem ‘All in the end is Harvest’ so very eloquently implies that a person’s life doesn’t finish when they pass away, they live on in their loved ones, it brings hope. This made me want to include a view of a field of corn, a happy view for the patient, and a symbol of the circle of life. I did play with the idea of a bird’s nest, the egg and the nest and the circle shape and what they represent, but the field was a stronger nod to Saunders. Saunders also felt the environment of the Hospice should be homely and comforting, so the setting was easy to imagine. All Google Doodles must incorporate the company name. Was it easy to integrate it into your illustration? Do you have any fun designs that you can share? It was a little tricky! But I loved the challenge and I loved experimenting with such an iconic design! I wrote the text separately, drew it with tree branches, picture frames and hidden in the wallpaper, but I think having it below the image separately allowed the text and image the space they needed to be considered by the viewer. Did you have a favourite design that wasn’t selected? 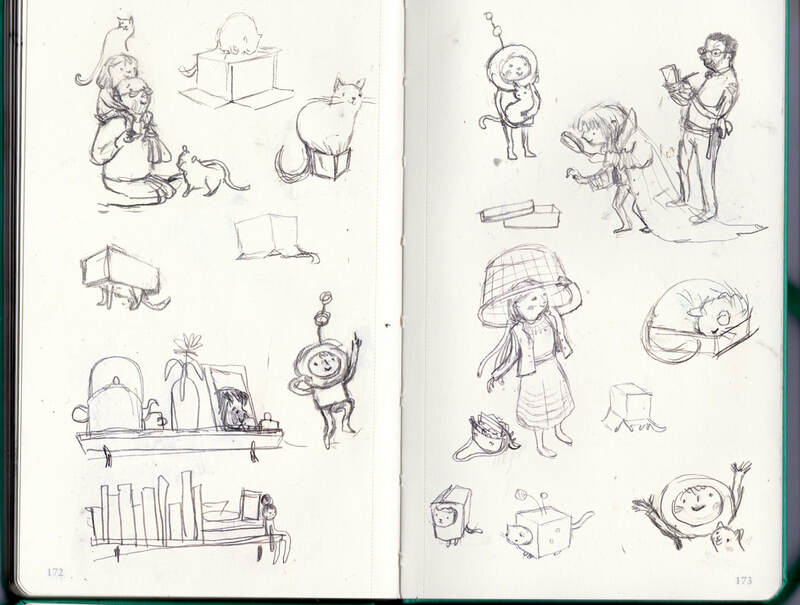 ​I did enjoy the picture frames sketch (above), but again this wasn’t so clear as a concept to summarise Saunder’s work, although I did find that one fun to sketch! In a way I wonder if that’s more sad as an idea, a person’s life summed up in a few frames, than the image that was the final artwork. It also meant Saunders could be included in the image, representing the care behind the Hospice. You have a big following on Social Media, I’m sure everyone would love to hear what’s coming next from Briony May Smith? I have some really exciting books publishing next year, including LITTLE BEAR’S SPRING written by Elli Woollard, publishing with Macmillan Children’s Books, & TOOTH FAIRY IN TRAINING written by Michelle Robinson, publishing with Walker Books (cover reveals below!). I'm particularly proud of both of these books. I have also recently signed a 2-book deal with US publishers, Schwartz & Wade, and cannot wait to start working on my own author-illustrated picture books with them. 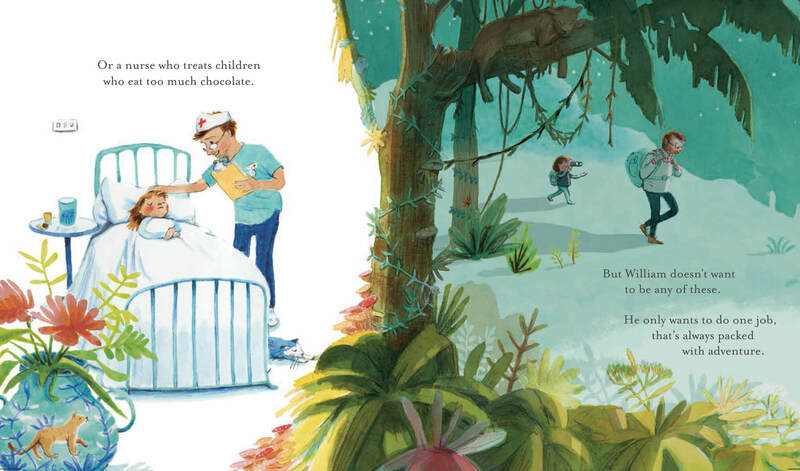 A Whisper From Grey, written by Louise Greig, illustrated by Lo Cole, and designed by Abi Luffman publishes this month with the lovely folk at Egmont Books. It's a stylish, lyrical book, with clever peep-through die-cuts, that deals with colours and emotions. 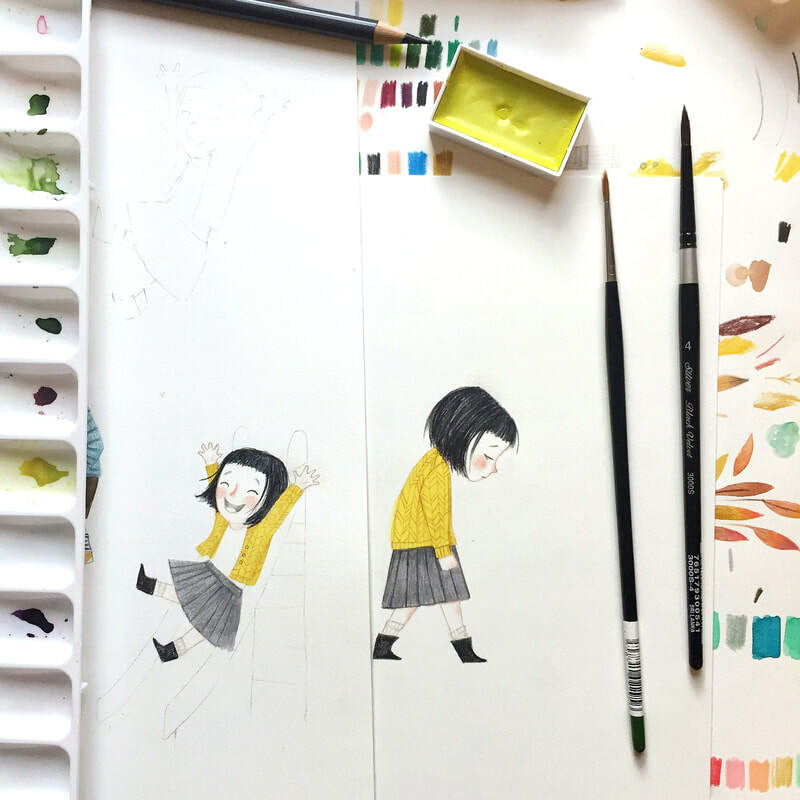 To celebrate its publication we caught up with illustrator Lo to find out more. So Lo, what attracted you initially to this project? I liked the idea that the story was about grey existing as a colour in its own right. There are lots of books about other colours, but grey seldom gets a mention. I was drawn to the lyrical nature of the text. Louise Grieg’s quiet and gentle story appealed to me, as it presented scope for a bold and graphic approach to the imagery. How did you approach to the illustrations for this book, were there any tricky problems to solve visually? Yes, originally the book was conceived as a straight forward picture book. But then Egmont, the publisher, were keen to include die-cuts to introduce another layer to the illustrations. One difficulty was to create die-cuts that were integral to the text, rather than incidental. However, the main challenge was what happens as a result of making a hole in a page. The thing about die-cuts is that they have a knock on effect. The hole that’s made in one side of a page effects three other pages, and thus determines to a large extent such fundamentals as location of specific colours, composition and positioning of text. I wanted the die-cuts to read two-ways, in order to add an element of surprise and as another layer to the story. 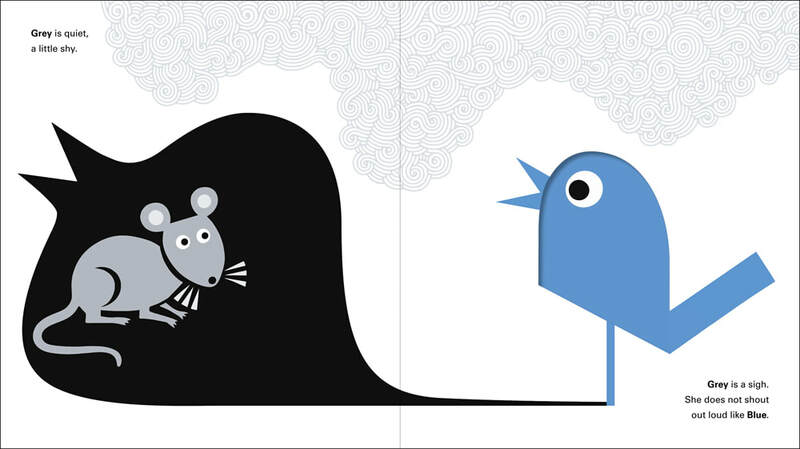 For example with the first two spreads, the shape of the blue bird becomes the hole for the mouse to peep out of. This die-cut solution actually happened almost by accident. The challenge was to then find enough ‘happy accidents’ for the rest of the die-cuts on the remaining spreads. What is surprisingly hard to achieve, can look very simple … if you get it right. How do you create your artwork? It usually starts with a few scribbles on some throw-away A3 copy paper. I tend to cover several sides with scribbly thoughts and thumbnails. I can’t wait to start working in colour, so as soon as there is the grain of an idea or an image, I will go the computer and create a file at the correct image size. By naming and saving it, I feel I’ve started the process and that all I have to do is save it again, but next time, with an image on it. I guess that’s the hard part. I use only Photoshop and work on a large Wacom tablet. The great thing about this process is that it feels very natural and less like working at a computer. It’s not the same, but it’s very much more like working at a drawing board. I like it because I can draw with my whole arm, not just from the wrist, so I can be quite gestural. Once I have an image crudely working in colour, I will zoom in on it and refine the shapes and detail, moving elements about and tidying things up. Do you have a favourite spread or piece of art in the book? I’m usually hyper critical of my own work and tend to wince when I see the results in print. One thing that pleased me about this book was how nicely it’s been produced, on crisp uncoated paper with nice inky flat colours. 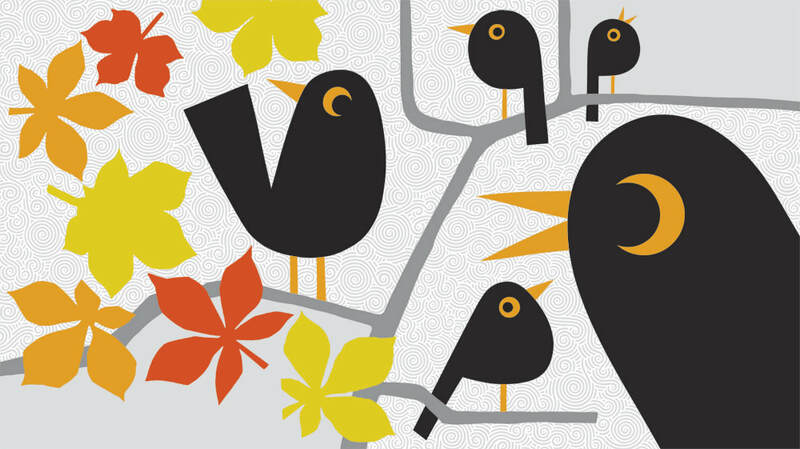 If I had to choose a favourite spread, it would probably be the penultimate one, the one with the black birds on grey twigs and the falling autumn leaves. Do you have any styles of art or illustration that have been influential in your career? I grew up surrounded by art and was dragged around galleries and churches from a young age. I had no choice in the matter and found myself heavily influenced by great artists such as Picasso, Matisse, Klee, Léger… the list goes on. My mother was an illustrator and watching her draw was awe inspiring. I absolutely adored Tintin and Superman comics - basically anything with pictures. I grew up with The Beatles and Yellow Submarine, so I guess there’s an element of that in my work too. Later, I discovered an affinity with the more graphic approach to illustration and could spend hours pouring through Graphis annuals from the 50’s and 60’s and old copies of the New Yorker magazine, falling in love with artists such as Saul Steinberg and Paul Rand. If you were a colour which would it be? That’s a tough question. I think all colours are equal, but any colour can look rubbish if it’s in the wrong company. I don’t think I’m grey though! 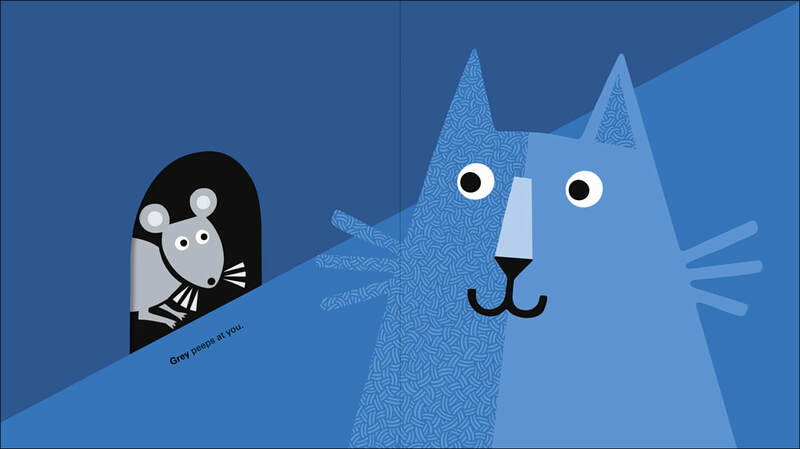 A Whisper from Grey, written by Louise Greig and illustrated by Lo Cole, designed by Abi Luffman, is published by Egmont Books, £7.99. 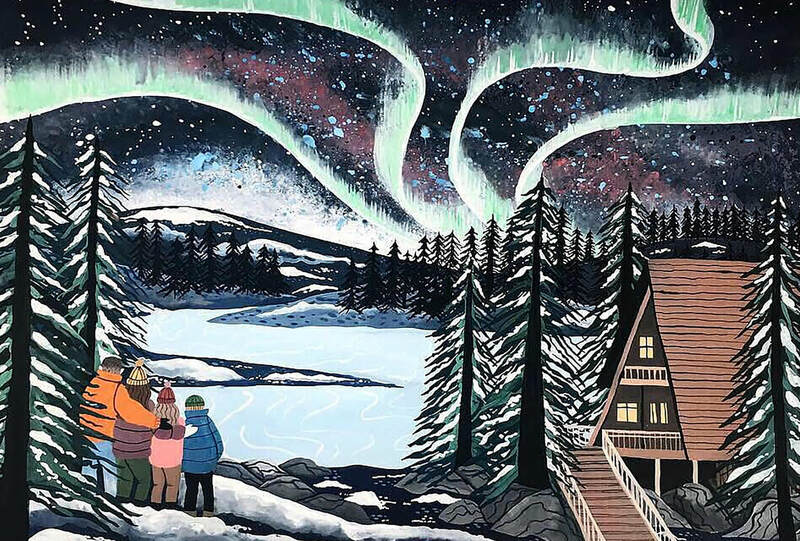 This week we sat down with new artist Isabelle Follath to talk more about her process in creating Joy, her first illustrated picture book that published last week. 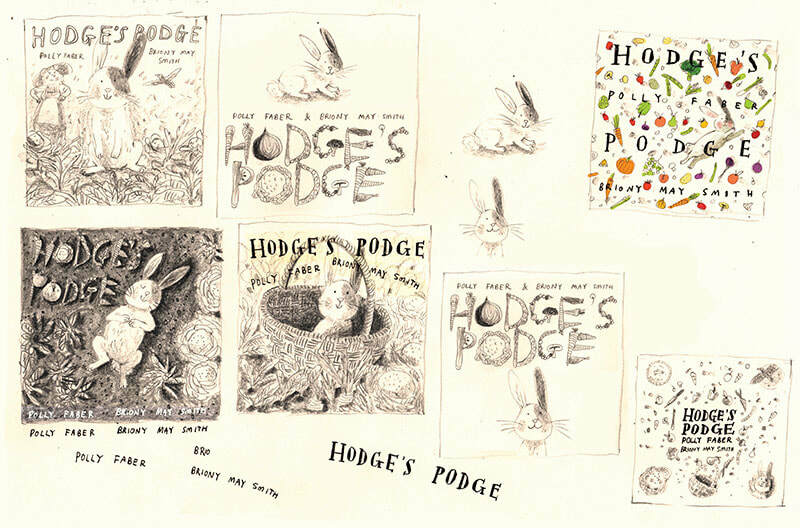 I had just finished an intensive five-week class about illustrating children’s books with Art Director Zoë Tucker and agent Lilla Rogers, when I was commissioned by words&pictures (and imprint of Quarto) to illustrate a picture book for them. 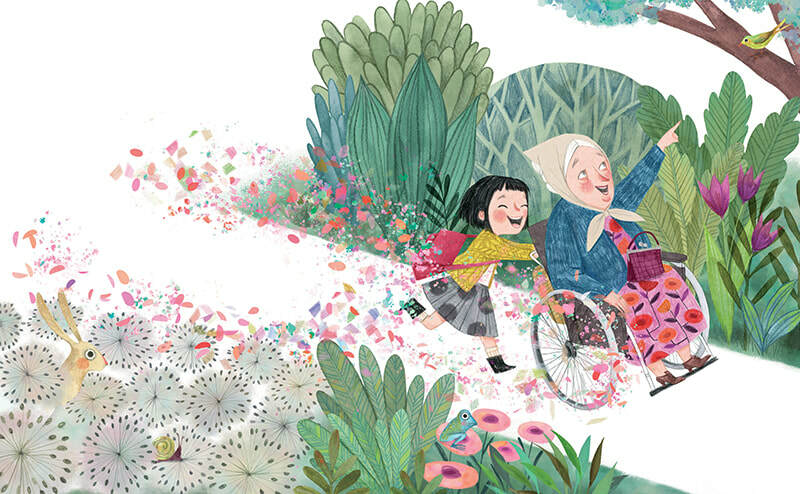 A beautiful and heart warming story by Corrinne Averiss about a little girl and her grandmother and the nature of happiness and empathy. ​Naturally I was thrilled to bits and also slightly overwhelmed. But remembering what I’d learned in the class, I started by drawing just accessories for the characters to get a feeling for them (in this case: clothes, toys, lots of cakes, blankets and comfy chairs). I love drawing characters and Matthew Morgan and Sarah Chapman-Suire, the lovely creative team at words&pictures, gave me free reign. So the main characters were developed quite fast. 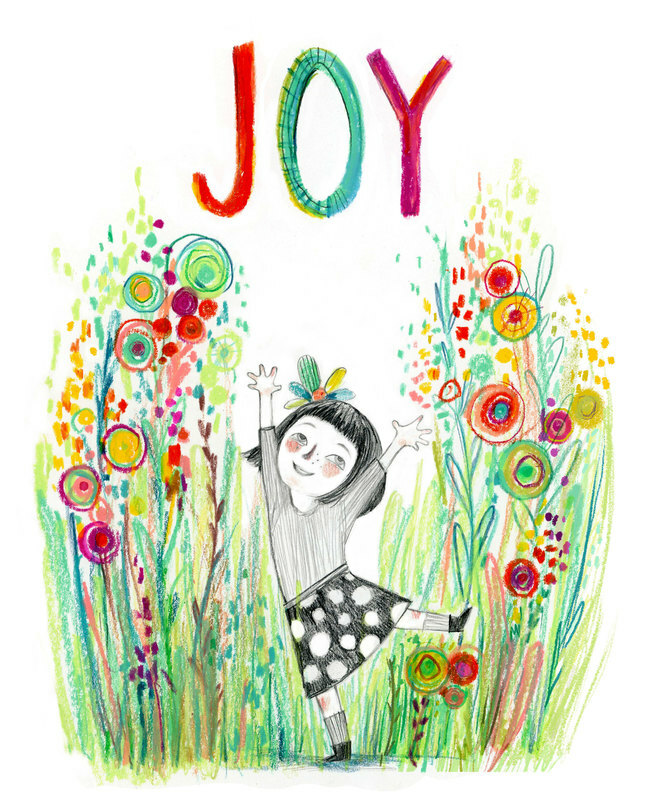 I also had to think about how I would illustrate joy, an abstract feeling that means different things for everyone. I ended up exploring abstract shapes and colours that changed slightly with every joyful experience of the main character. Brian Wildsmith and Björn Wiinblad and their exuberant use of colour were a big influence for me. 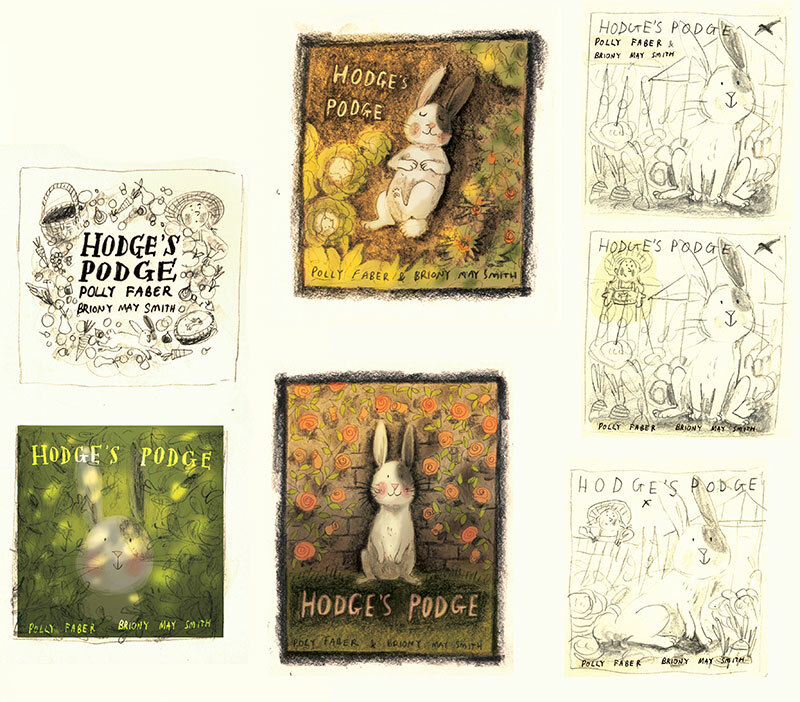 ​Sarah and Matthew were very supportive and the roughs for the cover and spreads were accepted with minimal changes. Next I worked up the coloured spreads in watercolour and pencil, drawing some elements separately and putting everything together in Photoshop. This allowed me to adjust the colours and move the ‘whooshes’ around. Which I did extensively; I was endlessly moving butterflies and swirls of colour around the page! All in all it was a very intuitive process. I tried to re-enact the emotions the story was conveying and moved from warm and to cool colours, and from busy to calm compositions. I would definitely do more planning on the colour scheme for my next book, but maybe for Joy this more organic process was the right thing to do. ​Working on Joy was a wonderful experience and it was a real blessing to have such a lovely, supportive and encouraging creative team behind me. I’ve learned so much and will continue to do so while illustrating future stories. For me, this is the true beauty behind creating a book. For the keen-eyed among you, you might have noticed a new portfolio pop up on our artists page this week. 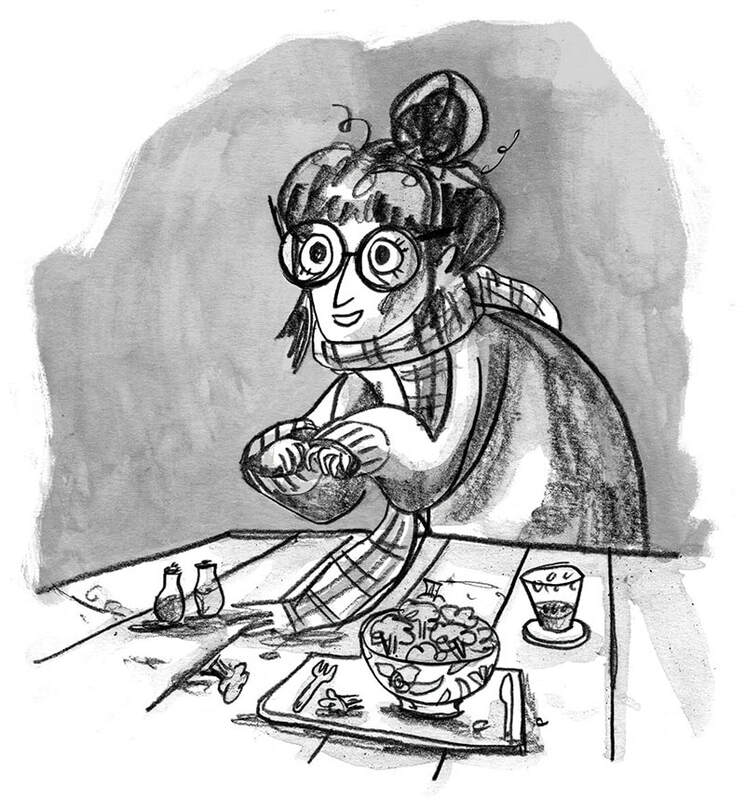 We're so pleased to welcome our newest signing at Pickled ink, Isabelle Follath! 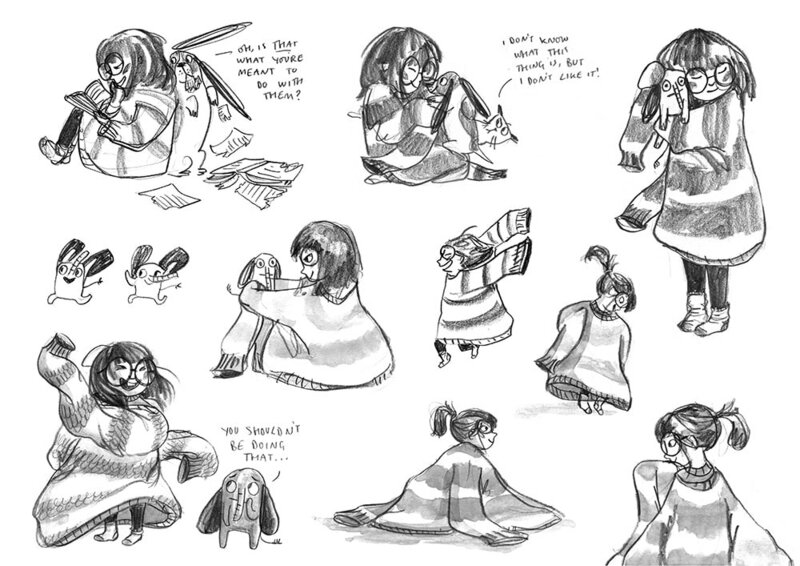 We came across Isabelle's artwork on Instagram and instantly fell in love with her brilliant character sketches, and just had to get in touch to see if she was looking for representation. To our delight, Isabelle was keen to work with us and we already have some exciting projects on the horizon. We're sure you'll love her work as much as we do. Find out a little more about her below. ​I spent my childhood doodling on every available surface and creating my own world through drawing and cutting out all the characters from my favourite picture books. However, I made a rather lengthy detour by studying Philosophy and Computer Science at university, only doing small illustration jobs here and there. Eventually I took the plunge and started to work as a freelance illustrator for advertising agencies, fashion magazines and book publishers. 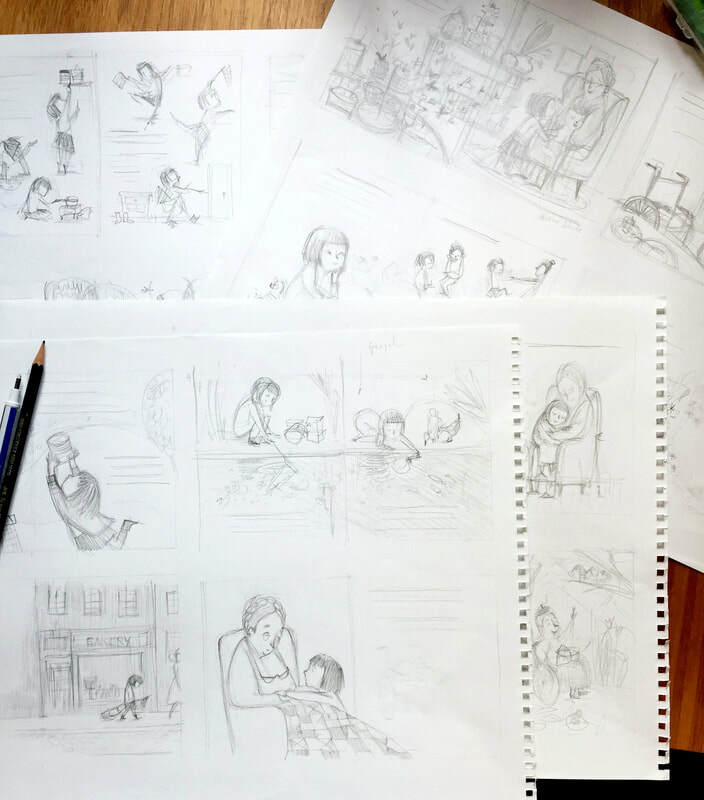 With the birth of my daughter my love for picture books grew and when I took an e-course on illustrating for children’s books, I knew that I had found my happy place. 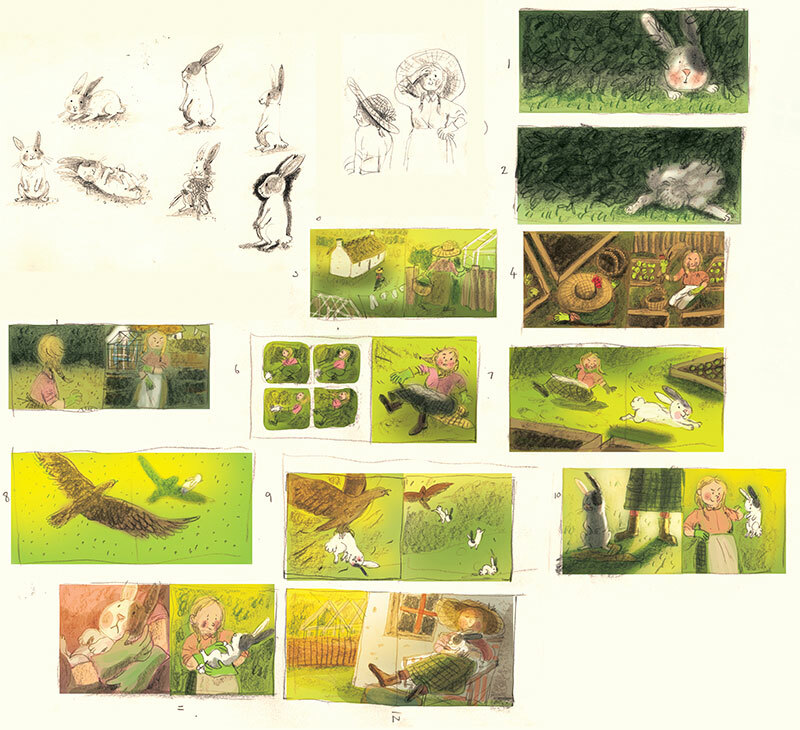 Soon after I finished the course, I got my first assignment to illustrate a picture book with Quarto. 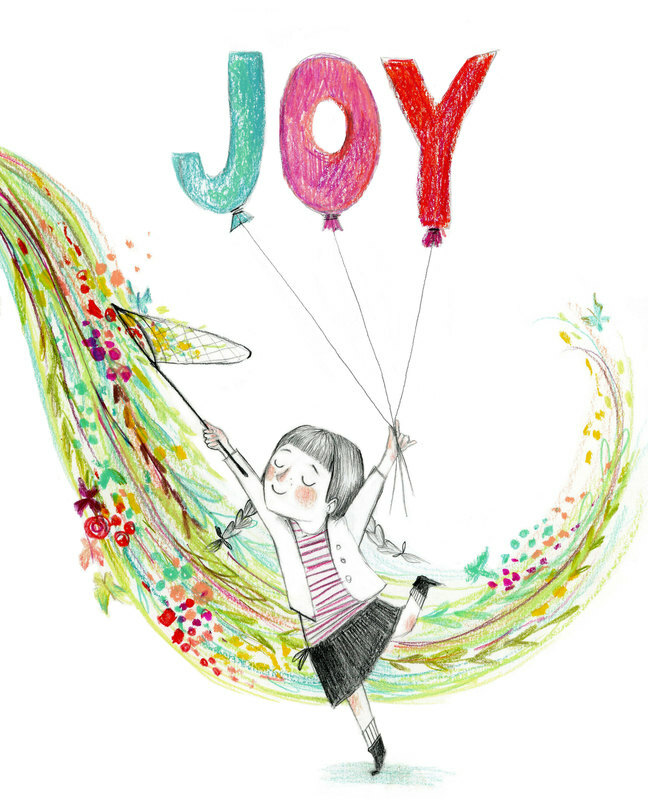 'Joy' written by Corrine Averiss, publishes in July under the imprint words & pictures. I find inspiration everywhere, from the pebbles and flowers in my garden, to the colourful packaging in the supermarket. My preferred materials are pen and ink, watercolour, pencil and digital techniques to put it all together, but I'm always exploring new media. When I’m not drawing you can find me making more coffee, trying to learn new crafts or going on a hunt for art supplies and the perfect greenish-gold watercolour. 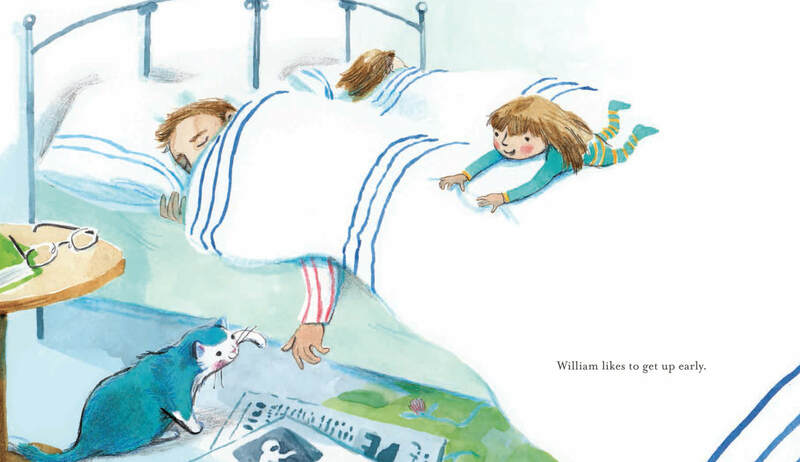 ​Looking After William, by Eve Coy (Andersen Press, £11.99) publishes today. It's always great to hear how a book comes to life, from the seed of the idea to the finished book you can buy in the shops, and Eve has provided us with a fascinating insight. 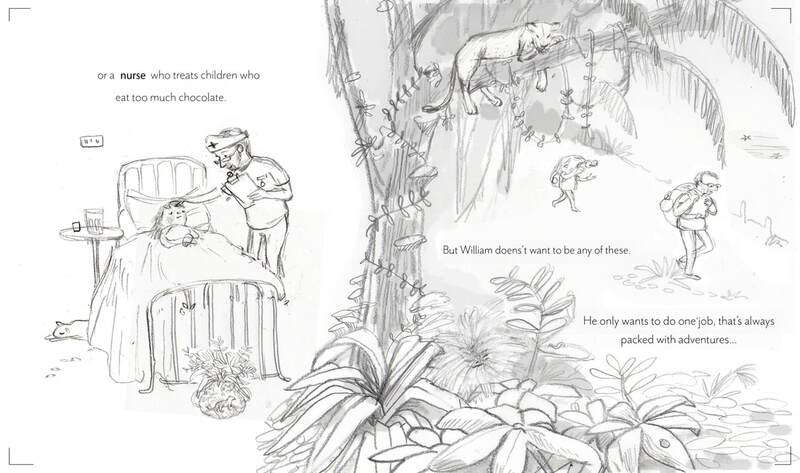 Congratulations on Looking After William, your début author-illustrated picture book, publishing. How does it feel to hold a copy in your hands? It’s a mixture of emotions and it is somewhat overwhelming! Where did the initial idea for the story come from? And how do your ideas usually come together? Is it an initial character sketch or scene that you develop out? Or do you work on an over-arching story first? I spend a lot of time jotting down ideas or observations many of which are inspired by my family. 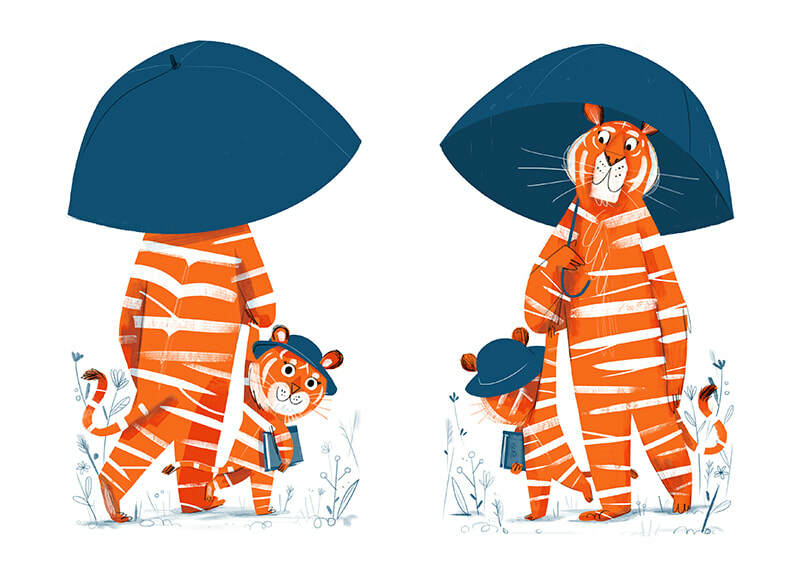 This particular idea started whilst daydreaming on a train.​ I was imagining a book where the words were opposite to the pictorial narrative so that children could get a feeling of knowing something that their parent didn’t. I guess the idea is similar to going to a pantomime where children call out “it’s behind you” only for the adult to turn around just at the moment it disappears. I wanted to try to capture that feeling in this book where the words say one thing but the pictures tell a different story. Libby Hamilton at Andersen Press acquired the book at Bologna Children’s Book Fair 2015, how did that initial idea or germ for a story develop into the finished book? Did it go through many changes or different directions? The book went through many changes but generally the idea stayed pretty constant. Working with Libby and Beccy was brilliant. This is my first book and so I was definitely learning as I went along. Libby and Beccy were so encouraging of my ideas and designs that it was a real pleasure to work with them throughout the project. We used to Skype every couple of weeks to catch up on how things were going. One of my favourite parts was a suggestion made by Libby to have the cat trying to eat sugared mice. The chocolate shop is one of my favourite images and I particularly love that little detail. It certainly wouldn’t have been the same book without their excellent advice! ​Did you find that writing the text or illustrating the pictures came more easily to you? Do you have any advice for other début creators about the process? The text definitely came first but thats probably because it is such a short story, however I loved making the illustrations much more so I enjoyed taking my time over those. I think it’s important to believe that if you really want to make a book, you can. Personally I find self belief really hard, but no one ever makes a book that hasn’t tried. So I’d encourage people to go for it, it’s a great experience. ​If you were to do it all over again, is there anything you would do differently? Can you explain why? A small thing I’d change is I struggled with the French ultramarine blue watercolour that I was using. It was particularly grainy and I even had dreams about granulating blues... I think I’d use a blue gouache paint instead now. 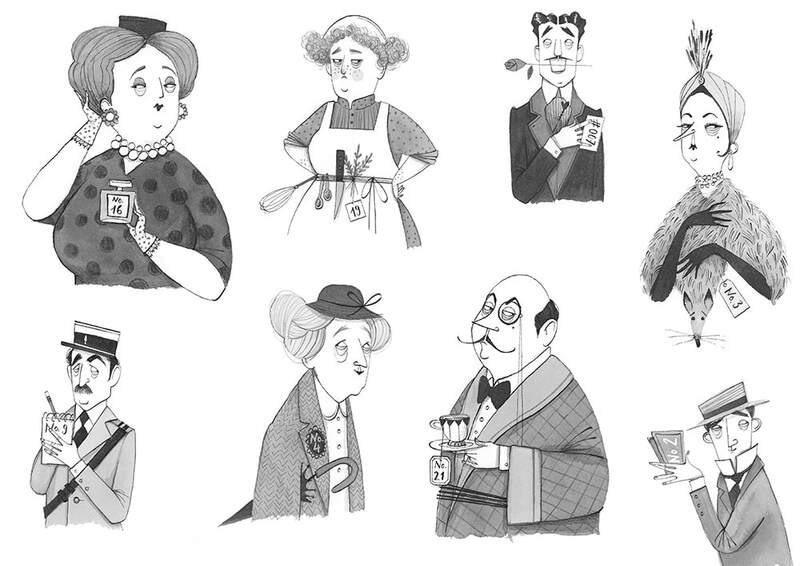 Can you describe your process for creating the illustrations from initial character sketches to the final art? What medium do you work in and do you have a favourite part of this process? For this particular project I used Windsor and Newton water colour and pencil crayons and my favourite da Vinci brush. My favourite stage is doing the rough drawings. I love the freedom of those early scribbles but I also love it when you have happy accidents with the finished artwork. My roughs drawings tend to be really small because I can then draw hundreds of little images much quicker than I could ever draw big roughs. In addition small doodles feel far less intimidating. ​​Looking After William is dedicated to your husband, Will. Does the real life Will bear a resemblance to the character? Or is the little girl (and her cat) based on your own children? Most definitely YES. The girl is based on a combination of my two daughters, she looks most like my second but is also like my eldest. William is most assuredly based on my husband, Will who is also a great dad! ​It is also dedicated to your daughters, Polly and Bea. How much did they inspire you to begin working in the world of children’s books? And how much do they continue to inspire you in what you do? My children have been a huge influence. I think I really discovered the joy of children’s books through reading to my daughters. Trips to the library became an essential part of our lives. My girls are also hilarious, like most children and so of course they have been hugely inspiring to the stories I’ve written. 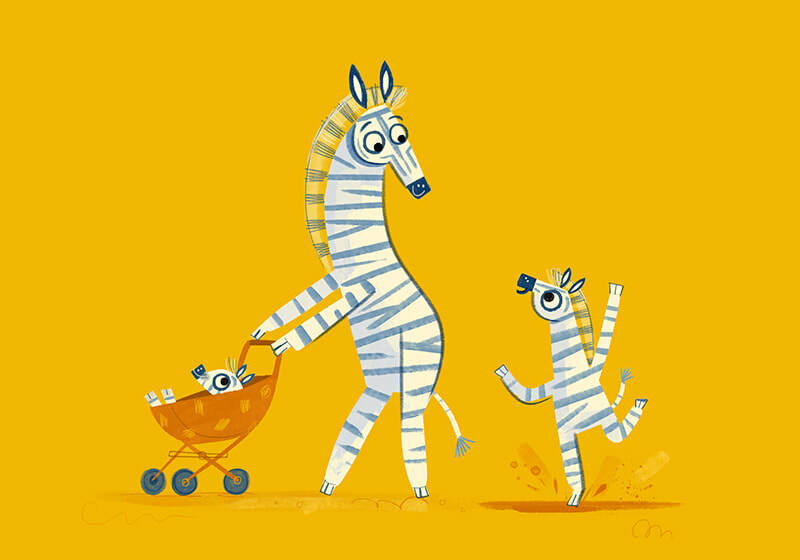 You have worked in the world of animation, how does creating picture books differ from that? Both art forms have their unique qualities. Animation is very much a team endeavour with often hundreds of people working on any particular project together. Working on books can be quite isolating, so having regular chats with a fantastic Editor /Art Editor and lovely agent can really help with cabin fever. Working in animation has been really helpful because it has taught me to draw lots and to think about characters and story structure all of which has been very useful for making books. ​What has been the most rewarding aspect of creating Looking After William? And can you give our readers an insight into what’s coming next from Eve Coy? There really is no feeling like opening up a parcel to discover your printed and bound book. That is the best feeling ever! I also saw online that a little boy had dressed up as an astronaut after reading my book. That is also pretty lovely. In terms of my future projects, I have just finished illustrating a book for Puffin and am now working on a new story back with Andersen Press. I’m excited to see how it develops. 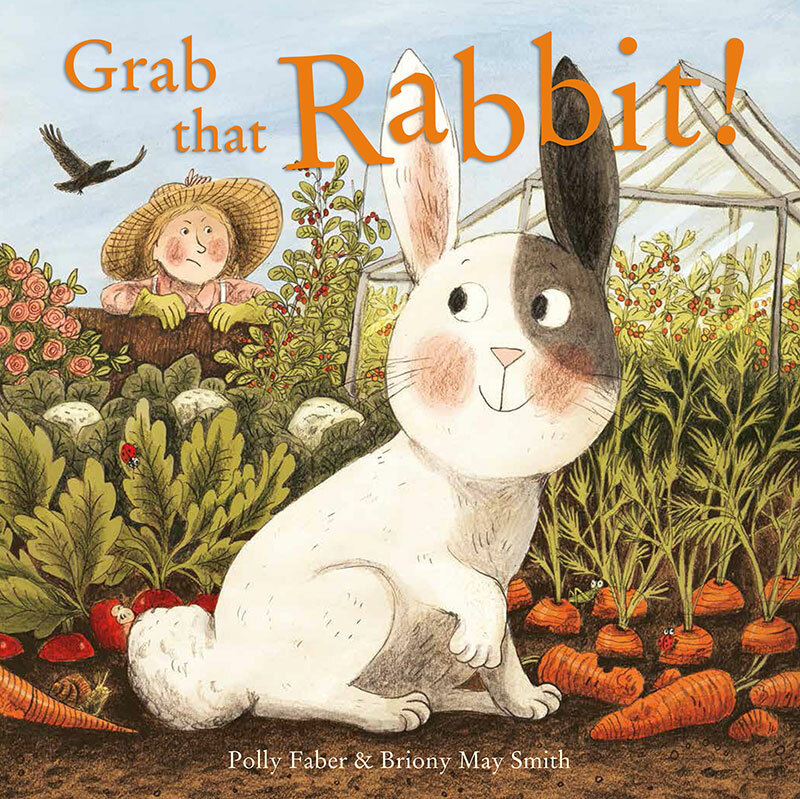 Briony May Smith - Grab that Rabbit! 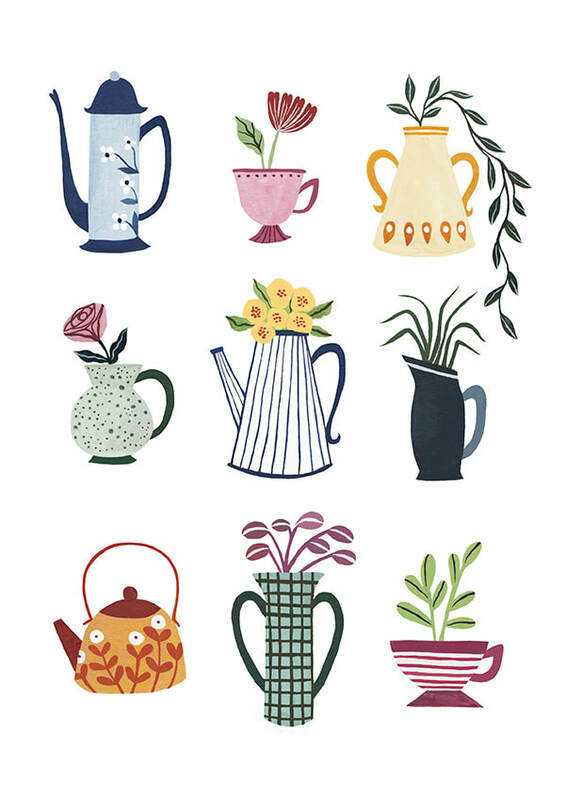 Today's blog post introduces our newest signing, Briony May Smith, to the portfolio. 'Grab that Rabbit', with Pavilion Books publishes today, coinciding nicely with World Book Day, so we thought a behind-the-scenes look at the project was a fitting choice! 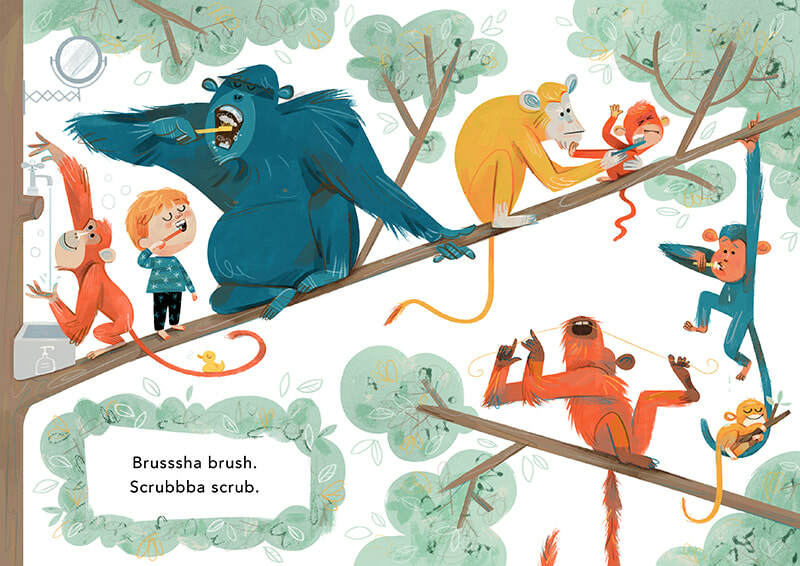 I was so excited to illustrate Polly Faber’s funny, gorgeous tale of a greedy bunny and the dangers he encounters! 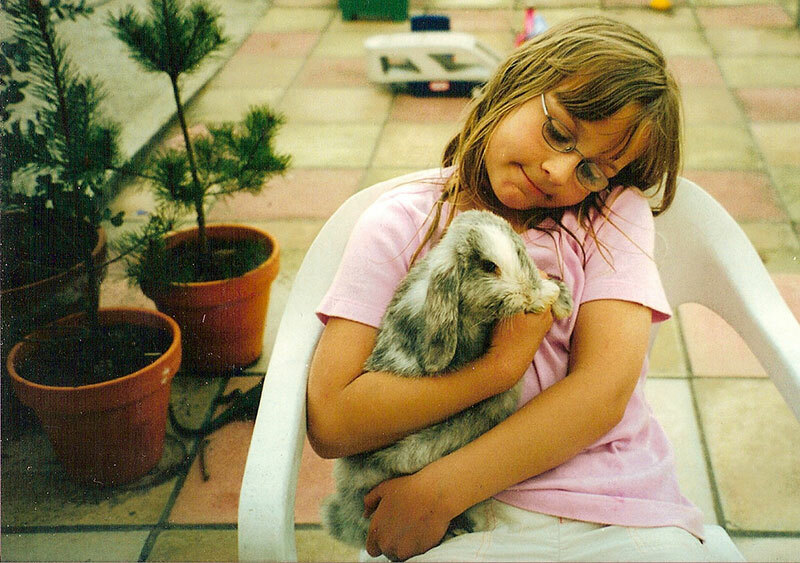 I’ve always had a soft spot for rabbits, I had one called Daisy growing up (shown here on the right). He was sexed incorrectly, hence his feminine name, which stuck. I won a £20 voucher in a ‘Pets At Home' drawing competition and I bought Daisy with my winnings. When I was 9 my best friend Natalie and I were adamant we would live together when we were grown ups and keep as many rabbits as we wanted. 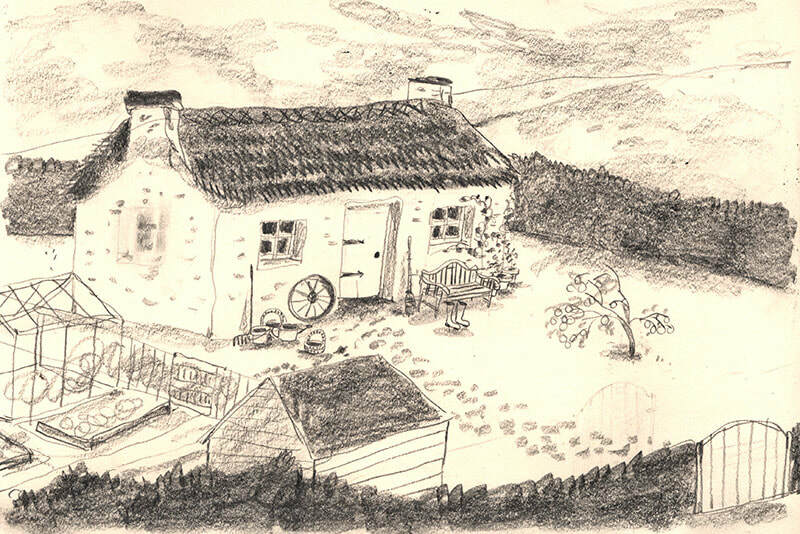 ​When I started sketching the character of Hodge, two lambs were born on a nearby farm. One had a very striking black ear, which prompted me to place Hodge’s 'black splodge', as described in the text, on his ear and face. 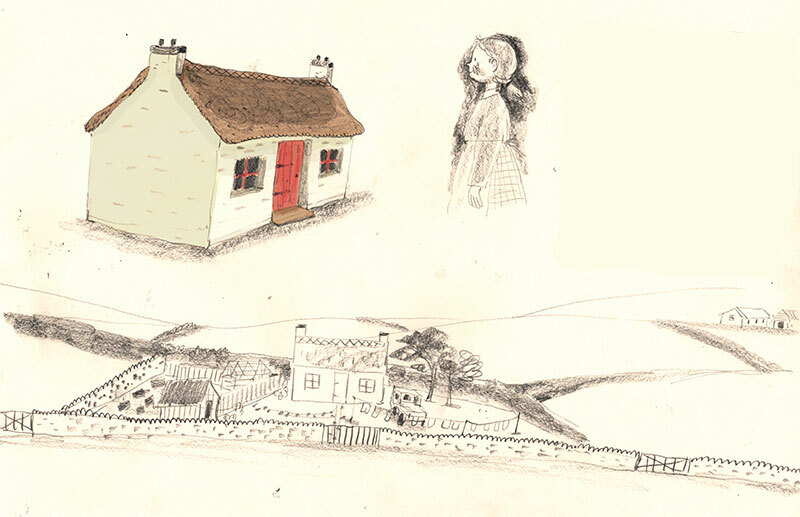 The cottage of Mrs Sprat is loosely based on the cottages I love to look at in Ireland, where half my family are from. ​It was an absolute delight to work on this text, starting with a few concept pieces, followed by loose thumbnails and roughs, and then onto colour artwork. I had a lot of fun hiding bugs and little details into the artwork, as I fondly remember looking for secret stories in picture books as a child. There are even items I own in the book. There are dog figurines based on my dog Finbar and our old family dog Paddy. I also own a sheep figurine and a tiny China teapot and a blue mug with pink flowers which feature in Mrs Sprat’s kitchen. There is a white chicken in a frame which is our ten year old chicken Sully. I hope people enjoy reading about Hodge and his adventures! ​Welcome to the agency, Briony!